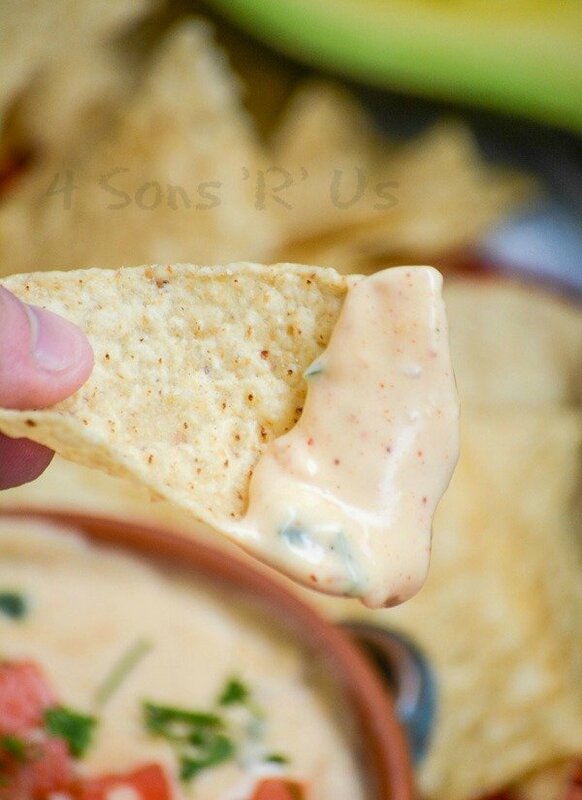 The perfect copy cat, this Restaurant Style White Queso Dip is flavorful with that thick, creamy consistency you’re craving. It’s also surprisingly simple, to make and to adore. We strongly encourage (read here: require) all of our kids to get a job when they turn 16. They can work one shift, shoot one hour, a week– or as many as they’re able to and maintain their grades. That choice is up to them and usually their maturity level. Son # 2 has had a few jobs before settling in at a local Tex Mex barbecue joint, coincidentally run/owned by two guys I went to high school with. It’s been awesome. It’s a great family atmosphere and they pride themselves on taking care of both the customers and the employees. In that vein, they send the kids home with all the mess ups/left overs they could want and then some. My boy always sneaks a nip of their leftover homemade queso home for his Mama. It’s my guilty little pleasure, that until he started working there, I didn’t even know I was obsessed with. And it’s best enjoyed with their amazingly crisp fries. But it’s still just as finger lickin’ good on a crisp chip. Being that the sons’ in culinary school, and that he has access to the kitchen to watch and observe– we’ve been making it at home for months now. And OMG, it is fantastic. It’s like no other we’ve made, or even tried at other venues. I kid you not, this isn’t chili queso. Neither is it queso con carne, or any other version of queso you may have heard of. It’s the holy grail of Tex Mex Dips– the all white kind. You’ve heard of shakin’ things up… it’s no secret, y’all know how much I love to and live for seasoning things up around here. 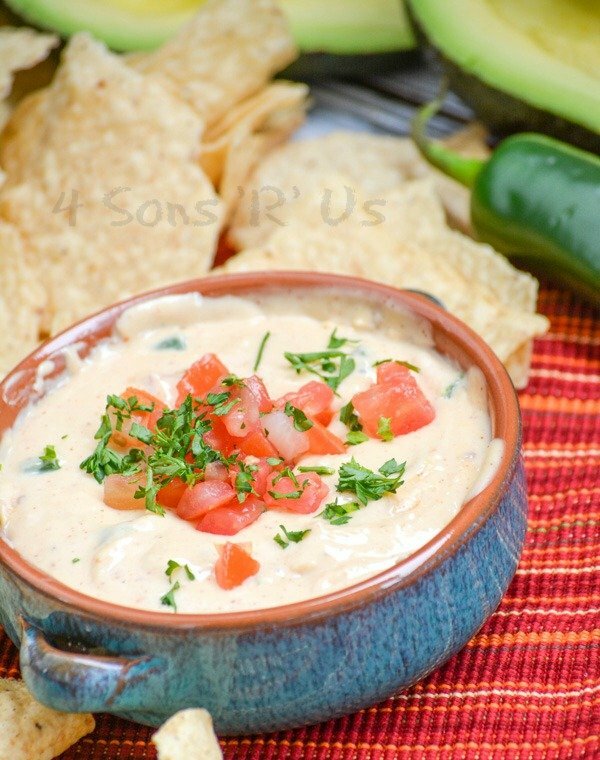 This Restaurant Style White Queso Dip wasn’t going to be any different. I deliberately, and heavy handedly, spiced this version right on up. But I did want to give you a heads-up and let you know that’s why this version has an ever-so-slight reddish hue. You want the traditional 100% white color, skip the spices. Okay, the nutmeg is probably safe. But omit any red spice. Still with me? 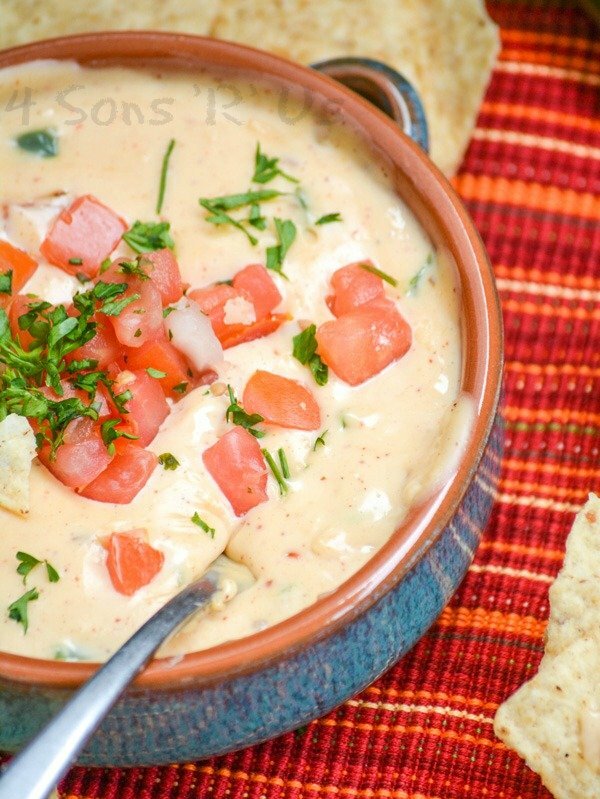 If you want a copy cat white queso that will also knock your socks off…stir in alllllll the spices. Me? I say… Doooooo it! 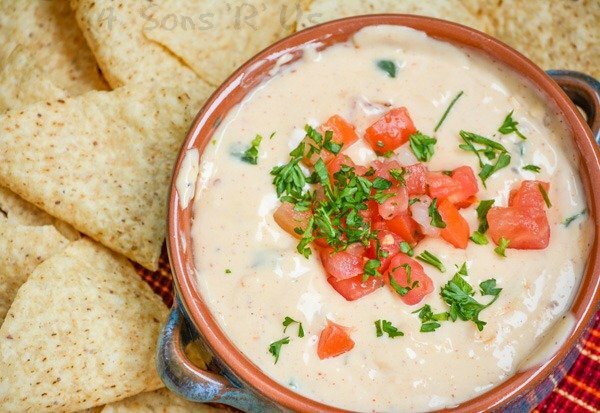 Thick & creamy, with plenty of beautifully blended spices– this Restaurant Style White Queso Dip is the version you’ve been searching for. 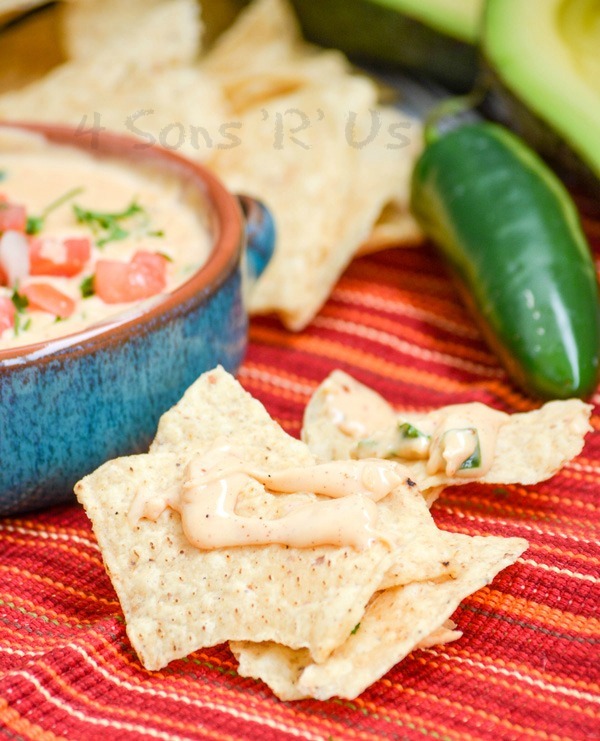 A spot on copy cat of your favorite restaurant Queso dip, that's quick & easy enough to get your anytime. Heat the half & half in a medium skillet over medium/high heat. Watch as soon as it starts simmering, just before it reaches a boil, reduce the heat to low. Starting with the american cheese, slowly stir the cheese in working in batches. Slowly increase the heat to medium, stirring constantly. And I do mean stirring constantly. As each addition of cheese is completely incorporate, smooth/bubbly, add a bit more and continue the process until all the cheese has been completely incorporated. Stir in the chilies, chili powder, nut meg, salt & pepper, and chili flakes until evenly incorporated. At this point you have two options. A) Transfer the queso to a bowl or a small crock pot to keep it warm, and serve with chips. B) Transfer the queso to a small oven proof dish, and broil for 3 minutes, or just until it begins to bubble and brown. Whichever method you choose, top the dish with diced tomato and cilantro leaves before serving and enjoy! I live overseas and can not get fontina cheese…will it make a difference?